The millionaire businessman became Oklahoma’s 28th governor Monday as he and other statewide elected officials took their oaths of office during a ceremony at the Oklahoma Capitol. 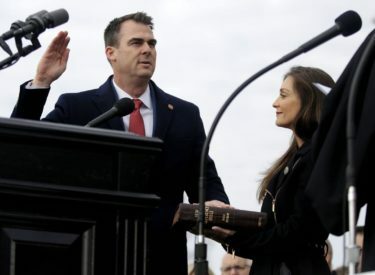 Stitt said traveling to other states as CEO of his mortgage company showed him that Oklahoma was struggling, and that inspired him to want to make a change by getting into politics. The 46-year-old father of six replaces term-limited Republican Gov. Mary Fallin. Stitt distanced himself from Fallin while campaigning and has replaced nearly all her top appointees. But he will get to take advantage of difficult fiscal decisions Fallin and the Legislature made last year after months of grueling negotiations, which led to a statewide teacher walkout.